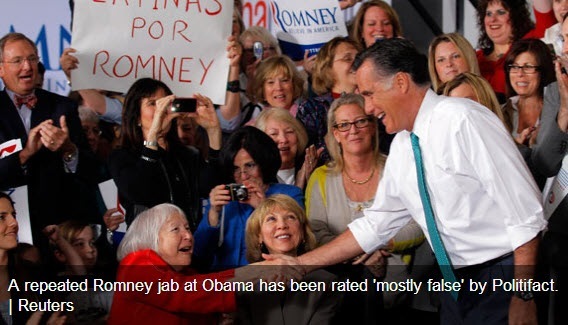 Photo Source: “A repeated Romney jab at Obama has been rated ‘mostly false’ by Politifact,”Reuters; Reid J. Epstein, Mitt Romney fumbles on women’s issues, Politico.com, April 11, 2012. The GOP sure to be nominee, Willard Mitt Romney, and his handlers, are either out of their minds or think the American public is extremely gullible and as a whole lacking one iota of common sense. I say this, because in the face of poor polling on issues affecting the lives of women he is now seemingly, without conscious, trying to take a position on women’s rights that diametrically opposes his life, his career at Bain Capital, and his earlier and current political career and political positions. However, when one looks at his record and positions on women’s rights, the contraception issue, Planned Parenthood, abortion, health care, and the Blunt Amendment, the new twist (i.e., flip-flop) to his political tale is shocking, and begs the question, just who is swallowing the bait? Willard is now revealing his new flip-flop or etch-a-sketch meme, while also reviving the relevancy of Seamus the dog riding on top of his car in an air tight container, which will forever serve as the epitome of his inability to show compassion and sympathy for others. What is especially troubling about Willard and his handlers is that by taking blatantly false positions on critical issues of our time, such as women’s rights, they essentially trivialize these critical issues. The issue of women’s rights is a real issue about real life, which should not be reducible to a game or game of politics. Photo Source: “Republican presidential candidate, former Massachusetts Gov. Mitt Romney, holds a flyer as he speaks in Hartford, Conn., Wednesday, April 11, 2012. Romney is intensifying his rebuttal of claims that he and fellow Republicans are insufficiently supportive of women, or even hostile to them. For the second straight day the presumptive GOP nominee campaigned Wednesday at a female-owned work site and denounced Democrats for saying his party is waging "a war on women” (AP Photo/Steven Senne). 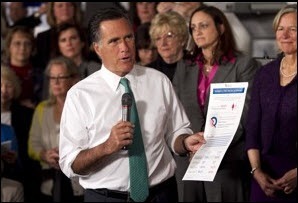 See also Romney holds the sheet that contains what the Associated Press dubs his “amazing statistic”, though, “it is dubious at best”, FACT CHECK: Romney’s eye-popping statistic on job losses by women raises eyebrows, too, Washington Post via AP, April 12, 2012. By comparing job figures with January 2009 and March 2012 and weighing them against women’s job figures from the same periods, Saul came up with 92.3 percent. The numbers are accurate but quite misleading. First, Obama cannot be held entirely accountable for the employment picture on the day he took office, just as he could not be given credit if times had been booming. Second, by choosing figures from January 2009, months into the recession, the statement ignored the millions of jobs lost before then, when most of the job loss fell on men. In every recession, men are the first to take the hit, followed by women. It’s a historical pattern, Stevenson told us, not an effect of Obama’s policies. Amazing it may be. As a meaningful measure of Obama’s economic record and its effect on women, though, it is dubious at best. Additionally, whether one characterizes Willard’s new etch-a-sketch meme as “mostly false” or of “suspect” quality, it still does little to alleviate his poor record on women’s rights. As earlier mentioned he has a record on women’s right that will be extremely difficult for him to flip-flop on, unless, through some miracle, he is able to find the most willing and gullible to take his bait. Then there is his private life at Bain Capital, which mostly remains a mystery. Willard as a co-founder of Bain Capital did, however, leave some evidence about his perspectives on life and people from this earlier period of his career. This is his vision for breaking the glass ceiling for women and minorities. The problem is that he, thought not surprising, is talking about only breaking through the glass ceilings of public companies, rather than private companies, such as Bain Capital. Fallihee even went as far as to contact the Harvard Business School African American Alumni Association, and verify that there was not a shortage of African American candidates with Harvard Business degrees (i.e., during this period over 2,200 graduates). Although, in rhetoric, “his entire life has been dedicated to breaking the glass ceiling,” Romney and Bain Capital never attempted to recruit African American Harvard Business School graduates. Photo Source: Sen. Ted Kennedy campaign ad in 1994; Jason Cherkis, Mitt Romney Also Attacked On Women’s Issue By Ted Kennedy’s ’94 Campaign (VIDEO), Huffington Post, April 11, 2012. The gender issue proved critical in that 1994 race, explained Tad Devine, a senior advisor and ad man for the Kennedy campaign. Moreover, the story has an ending that is familiar to us. Before publishing his article, Fallihee sent an email to Romney’s campaign advising them about a pending publication concerning the lack of women and African American managing directors employed by Bain Capital, while also asking them a question about the employment of women and African American managing directors. However, as Willard did when recently questioned about Bain Capital selling surveillance cameras to the Chinese government, he also failed to respond to Fallihee’s question. >>There is also the following article by Amanda Terkel, which addresses voting records and issues of women’s rights from the perspective of Willard Mitt Romney’s women surrogates. The following article is important, because it may well be the clearest indication of Romney’s position on women’s rights, rather than trying to have faith in his rhetoric. WASHINGTON — In recent days, Mitt Romney’s campaign has been trying to squash the perception that he’s bad with the ladies. It’s been bringing out everyone from Ann Romney — who insists that her husband really isn’t “stiff” when you "unzip him" — to other prominent Republican women. All are trying to make the case that the former Massachusetts governor will look out for women’s rights if elected president. But the records of some of these surrogates seem to undermine the campaign’s message. But two of his surrogates did vote against the legislation in Congress. On Wednesday, the campaign sent out statements from Republican Reps. Mary Bono Mack of California and Cathy McMorris Rodgers of Washington, blaming women’s jobs losses on Obama’s policies. But both women voted against the Lilly Ledbetter Act as well as the proposed Paycheck Fairness Act. A March 29 Wisconsin Women for Romney call with reporters featured Wisconsin state Sen. Alberta Darling (R-River Hills) and conservative activist Bay Buchanan. Darling was a cosponsor of legislation repealing her state’s 2009 Equal Pay Enforcement Act, which was designed to deter employers from discriminating against certain groups by granting workers more avenues for pressing charges. Wisconsin Gov. Scott Walker (R) quietly signed the bill into law last week. Buchanan has railed against feminism, stating in 1999 that the movement has hurt women. She blamed the high number of divorces, single-parent households and teen suicides on feminism in part. The Romney campaign is claiming that women account for more than 92 percent of jobs lost under Obama, but Politifact rated that statement as “mostly false.” The Romney campaign is now disputing this characterization.